Donald Glover showed up a day ahead of his stage performance at the Coachella Valley Music and Arts Festival to premiere his much-anticipated film Guava Island on Thursday night. 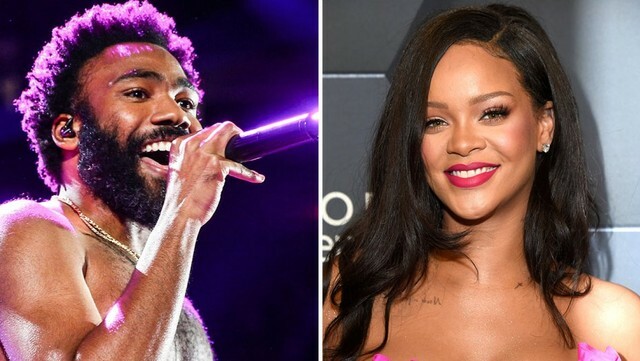 The 54-minute project, co-starring Glover, Rihanna, Letitia Wright, and Nonso Anozie, included a mix of animation and live action that primarily provided a platform for Glover to showcase his hit songs “Summertime Magic” and “This Is America.” Notably, Rihanna’s character Kofi does not sing in the film. Donning a wide-brimmed straw hat, Glover (who performs as Childish Gambino) screened Guava Island to about 100 guests in a specially constructed red metal theater with a domed ceiling on the Coachella grounds. The theater was decorated with faux grass flooring, tie-dyed cushions, and coordinating fleece blankets by Santa Monica-based company Society6. Five projectors set up in the cylindrical space displayed colorful graphics on the walls alongside the film during key musical scenes. Animations of cityscapes, tropical trees, gears, beach scenes, people, and more highlighted the vibrance the music created for the characters, living under the repression of a Communist government. The Amazon Studios project then cuts to live action and to Deni, who is preparing to perform at a local festival in his hometown on Guava Island (filmed in Cuba). Kofi works at a local sewing factory with Yara (Wright). Deni, a local celebrity, airs his music on the island-wide radio station and also works at Red Cargo, a manufacturing warehouse run by Red Cargo (Anozie). Cargo threatens Deni not to perform at the festival, because his employees will show up late to work the next day. “How do you know what’s best for everyone?” Deni asks. The boss smashes Deni’s guitar and gives him $10,000 to flee, leaving Deni to decide whether to help uplift his island with music or to protect himself. Glover weaves in his songs “This Is America,” “Summertime Magic,” and “Feels Like Summer” — performing the former in the warehouse with his coworkers in orange jumpsuits, their dancing reminiscent of his Grammy-winning music video. In the scene, Deni talks with fellow workers about greed in America before breaking out into song. He later croons “Summertime Magic” to Kofi on a beach and on a concrete pier. (Glover also sings new, short jingles like “Red’s Cargo”). The project focuses on themes of the power of music, social repression and political revolution. Guests entering the Guava Island screening party were greeted by fashionably-dressed stilt dancers and Afro-Cuban drumming. Festive Cuban fare included plantains, tamales, and cups filled with pineapple, watermelon and cucumber wedges dressed with spicy-sweet Bokados Chamoy sauce. Fresh coconuts imprinted with the Guava Island logo, sliced to sip the sweet coconut water, could be refreshed with rum or tequila when half-empty. Guests also received black Daydreamer LA T-shirts printed with an image of Glover and Rihanna from the film. Guava Island is directed by Hiro Murai, who has directed episodes of Atlanta as well as music videos for Childish Gambino, including “This Is America.” The screenplay was written by Donald’s brother Stephen Glover. Childish Gambino will perform at Coachella on Friday and Guava Island will continue to screen at Coachella until it is released on Amazon Prime Video on Saturday at 12:01AM PT. This article originally appeared at The Hollywood Reporter.